For other uses, see John Bishop (disambiguation). from the BBC programme Desert Island Discs, 24 June 2012. John Joseph Bishop (born 30 November 1966) is an English comedian, presenter and actor, who is also known for his charity work, having raised £4.2m for Sport Relief 2012. A keen footballer, Bishop played for non-League teams Hyde and Southport, and was known for having an aggressive style of play. He also worked as a pharmaceutical sales representative prior to becoming a stand-up comedian. His television debut came on The Panel. He has subsequently appeared in the E4 teen drama Skins (seasons 3-4) and in the Ken Loach film Route Irish in addition to his own shows including John Bishop's Britain (2010–2011), John Bishop's Only Joking (2013) and The John Bishop Show (2015). Bishop also had a regular Sunday slot on Liverpool radio station Radio City called Bishop's Sunday Service. Bishop is the youngest of four children born to labourer Edward Bishop and wife Kathleen Hackett. He grew up mostly in Winsford and Runcorn, Cheshire, and attended Murdishaw West Primary School and Brookvale Academy, after he and his family moved from Huyton, Merseyside. He briefly studied English at Newcastle Polytechnic and gained a Bachelor of Arts in Social Science from Manchester Polytechnic. In the 1990s, Bishop worked as a medical representative for the pharmaceutical company Syntex, before leaving in 2006 to pursue a career as a full-time comedian. He performed stand-up comedy for the first time in Manchester in October 2000, and the following year, made it to the final of all the major new act competitions, including So You Think You're Funny, the Daily Telegraph Open Mic Awards, the BBC New Comedy Awards, and the City Life North West Comedian of The Year Award, which he won. In 2002, he was named best newcomer by BBC Radio Merseyside, and in 2004, he won the North West Comedy Award for best stand-up. In 2009, Bishop appeared as the first act on Michael McIntyre's Comedy Roadshow in Manchester. That year, he appeared at the Edinburgh Fringe Festival, where his show Elvis Has Left the Building was nominated for an "Eddie" (Edinburgh Comedy Award). In 2009, Bishop appeared in Channel 4's series Comedy Showcase and was a contestant on Celebrity Mastermind. He also appeared in BBC Three sitcom Lunch Monkeys as fireman Terry. He has appeared five times on 5 Live's Fighting Talk quiz show, claiming four victories on the programme. His material is drawn from his life's experiences, including fatherhood, cycling around the world, playing semi-professional football, and working as a nightclub doorman. Bishop's first television appearance was in 2007 on the RTÉ topical-comedy show The Panel, where he was a regular panelist until 2008. He then went onto the Channel 4 panel show 8 out of 10 Cats before appearing on the BBC's Live at the Apollo. 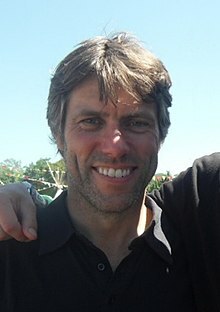 In December 2009, Bishop started his own TV show on LFC TV called John Bishop Meets..., where he interviewed former Liverpool football players. In 2010, Bishop was a celebrity team captain on What Do Kids Know? with Rufus Hound, Joe Swash and Sara Cox on Watch. He has also appeared on BBC's Mock the Week, and Radio 4's Act Your Age. In series 3 and series 4 of Skins, Bishop portrayed Emily and Katie Fitch's father. In 2010, Bishop appeared in Ken Loach's Route Irish, which premiered at the 2010 Cannes Film Festival. Bishop is a regular panelist on Sky1 show, A League of Their Own, as well as a stand-up/sketch show for BBC One titled John Bishop's Britain. On 11 July 2010, Bishop came runner-up in the second-ever game of How Many Peter Jones'? on ITV's James Corden's World Cup Live. He has appeared as a panellist on BBC programmes Have I Got News for You, Would I Lie to You?, and on QI. On 28 October 2010, he also guest hosted an episode of series 40 of Have I Got News For You. On 12 February 2010, during an appearance on Friday Night with Jonathan Ross it was revealed that prior to his TV breakthrough, Bishop had worked as a warm-up for the show. In March 2011, Bishop and fellow comedians Alan Carr, James Corden, Catherine Tate, and David Walliams appeared in the video for Take That's single "Happy Now" for Comic Relief. On 24 June 2012, he appeared on Desert Island Discs. On 28 August and 4 September 2012, he appeared in Accused as Peter for two episodes. In late 2012, Bishop appeared on BBC genealogy series Who Do You Think You Are? and on an ITV one off episode called Panto!, where he starred as a local Morecambe disc jockey called Lewis Loud. As of January 2013, Bishop hosts John Bishop's Only Joking on Sky 1. Bishop's autobiography titled How Did All This Happen? was published in October 2013 . In November 2013, he hosted the 2013 Royal Variety Performance at the London Palladium theatre in the presence of Charles, Prince of Wales and Camilla, Duchess of Cornwall. In December 2014, he appeared in A Night In with Olly Murs where he and Olly Murs had a lip-sync battle. In 2015, Bishop presented his own variety show on BBC One called The John Bishop Show. In May 2015, Bishop appeared as a special guest at the Liverpool date of Murs's Never Been Better Tour and performed "Troublemaker" with him. In January 2016, he took part in the BBC series Stargazing Live, appearing from the European Astronaut Centre, and following Tim Peake's astronaut training programme with a simulated spacewalk, underwater. Since September 2016, Bishop has presented John Bishop: In Conversation With... for the W channel. Two series have been aired: the show will return for a third series. On 21 September 2016, Bishop was confirmed to have a role in ITV drama series Fearless, which aired in 2017. On 29 September 2016, Bishop announced that he would be going on tour for the fifth time in October and November 2017 with a show titled Winging It. At the 2010 British Comedy Awards, Bishop won the Best Male Comedy Breakthrough Artist award. He became the Number 1 "Star in a reasonably priced car" on Top Gear on Sunday 23 January 2011 after he appeared on the BBC Two show. He drove the Kia Cee'd around the test track in 1 minute and 42.8 seconds to become the fastest star in the latest reasonably priced car, knocking Tom Cruise off the top. Bishop's record lasted nearly half a year until being knocked off by Rowan Atkinson (1 minute 42.2 seconds) on Sunday 17 July 2011. He was also the fastest in the League of Their Own skeleton race, beating Georgie Thompson and James Corden. On 18 July 2014, Bishop was awarded an honorary fellowship at Liverpool John Moores University in recognition of his contribution to the arts and charity work during a ceremony at Liverpool's Anglican Cathedral. On 30 March 2010, Bishop took part in Channel 4's Comedy Gala, a benefit show held in aid of Great Ormond Street Children's Hospital, filmed live at the O2 Arena in London. In 2012, he completed a 290-mile (470 km) triathlon from Paris to London in five days to raise money for the BBC charity Sport Relief. His "week of hell" began at the Eiffel Tower on 27 February, where he cycled 185 miles (298 km) to Calais. The next day, he rowed across the English Channel as part of a team including Davina McCall, Andrew Flintoff and Denise Lewis, then ran 90 miles (140 km) from Dover to London in three days, finishing in Trafalgar Square on 2 March. On 23 March, during the Sport Relief telethon, it was announced that his efforts had raised £4.2 million. Also in 2012, Bishop took part in The Justice Collective for their cover of The Hollies single "He Ain't Heavy, He's My Brother" for charities in aid of the Hillsborough disaster. In 2014, Bishop once again took part in Sport Relief as a team captain for the Clash of the Titans event competing against Sebastian Coe and his team. Bishop has also competed in numerous charity football matches including playing in the Ciaran Geddes memorial match at the Deva Stadium, Chester, where Bishop scored two goals while playing with his brother Eddie for Chester. On 27 May 2012, Bishop took part in the Soccer Aid match for Unicef, playing for the England team, who won 3-1 against the Rest of the World. On 8 June 2014, he took part in his second Soccer Aid football match, again playing for England, this time losing 4-2 to the Rest of the World. On 5 June 2016, he took part in his third Soccer Aid match, playing on England's team. In May 2014, Bishop donated £96,000 to the Hillsborough Family Support Group after being moved by personal statements delivered by the victims' families at their inquests. On 19 April 2016, Bishop served as host for a comedy gig at the Royal Albert Hall in aid of Teenage Cancer Trust. Bishop has been married to his wife Melanie since 1993, with an 18-month separation that began in 2000. They have three sons: Joe (b. 1994), Luke (b. 1996), and Daniel (b. 1998). They live in Cheshire. Bishop enjoys playing football and is an avid Liverpool FC fan, a fact frequently brought up on the show A League of Their Own, on which he was a panelist. He has three older siblings; brother Eddie (b. 1961) and two sisters Kathy (b. 1962) and Carol (b. 1965). Eddie, is a former professional footballer with Tranmere Rovers FC and Chester City FC. Besides Liverpool F.C., Bishop has said that he also supports Celtic F.C.. In July 2010, Bishop took part in protests against then-owners of Liverpool FC, Tom Hicks and George Gillett, and later took part in a celebrity-studded protest video put out on YouTube. Bishop pre-recorded a video message to the 2011 Labour Party conference, which was being held in Liverpool. Bishop has been a vegetarian for over 20 years. He talked about this on BBC Two's Something for The Weekend and his episode on food on his stand-up show John Bishop's Britain. On a 2013 episode of The Jonathan Ross Show, he said he had been vegetarian for 27 years. In 2013, PETA declared him to be one of the "Sexiest Vegetarians" of the year. In September 2016, Bishop was ranked tenth place on Forbes' Top 10 Highest Paid Comedians List where he had earned £5.4 million a year, making him the UK's highest earning comedian. Little Crackers Bobby Series 2, Episode 7: "John Bishop's Little Cracker"
2012: The Justice Collective – "He Ain't Heavy, He's My Brother"
^ "John Bishop". Desert Island Discs. 24 June 2012. BBC Radio 4. Retrieved 18 January 2014. ^ a b "John Bishop Biography (Personal Life, Career)". Retrieved 8 October 2015. ^ "John Bishop - Who Do You Think You Are? Not the only entertainer in the family..." TheGenealogist.com. 19 October 2012. Retrieved 27 September 2016. John was born in 1966, the youngest of four children, to labourer Edward Bishop and his wife Kathleen Hackett. ^ Jordan, Barbara (8 September 2011). "John Bishop congratulates adults with learning disabilities on their beer". Runcorn and Widnes World. Retrieved 29 September 2011. ^ a b Bishop, John (2013). How Did All This Happen?. Harper. ISBN 978- 0007436125. ^ "Comedian John Bishop says Tories are failing our young". Mirror.co.uk. 10 November 2012. Retrieved 18 January 2013. ^ "North West Comedy Awards - the winners! ", BBC Manchester. ^ "Edinburgh Comedy Awards - The Nominees". BBC. 28 August 2009. Retrieved 28 August 2009. ^ Bishop, John. "Standing up for men in Lycra: John Bishop tries pedal power". Daily Mail. Retrieved 4 March 2012. ^ "John Bishop's Britain". BBC. Retrieved 31 July 2010. ^ "RVP 2013, London Palladium". eabf.org.uk. Retrieved 26 August 2014. ^ Tansley, Janet (11 May 2015). "Troublemaker John Bishop joins Olly Murs on stage". ^ Butcher, David. "Stargazing Live, Series 6 - Episode 1". Radio Times. Retrieved 12 January 2016. ^ "Stargazing Live". Principia. Retrieved 12 January 2016. ^ "John Bishop goes Piers Morgan for new interview series". 1 March 2016. ^ "John Bishop returns to TV for new ITV thriller". 21 September 2016. ^ Guide, British Comedy (29 September 2016). "John Bishop announces 2017 tour, 'Winging It'". ^ Schofield, Ben (24 January 2011). "John Bishop named best Male Breakthrough comedian at British Comedy Awards". Liverpool Echo. Retrieved 29 September 2011. ^ "£4.2 million for Sport Relief". Sportrelief.com. 2 March 2012. Archived from the original on 22 August 2012. Retrieved 18 January 2013. ^ a b Beth Neil (11 June 2010). "John Bishop: We talk to TV's hottest new comedian - 3am & Mirror Online". mirror.co.uk. Retrieved 23 March 2012. ^ Reade, Brian (29 June 2014). "John Bishop's break-up hell: I sobbed on the stairs while I got kids into wellies". ^ "John Bishop: The brighter side of stand-up". Manchester Evening News. 29 April 2010. ^ "Our Eddie". John Bishop Online. Archived from the original on 3 February 2010. Retrieved 23 March 2012. ^ Weston, Alan (3 July 2010). "Mass rally to oust Tom Hicks and George Gillett from Liverpool FC". Liverpool Echo. Retrieved 29 September 2011. ^ Traynor, Luke (30 September 2010). "Hollywood film producer Mike Jeffries to launch anti Tom Hicks and George Gillett Liverpool FC campaign". Liverpool Echo. Retrieved 29 September 2011. ^ "The Laz Word...on the Labour Party Conference". Liverpool Confidential. 26 September 2011. Archived from the original on 27 June 2013. Retrieved 18 January 2013. ^ Midgley, Carol (27 July 2011). "Interview: John Bishop". Radio Times. Retrieved 23 March 2012. ^ "John tells his parents he's a vegetarian". John Bishop's Britain, Series 2, Food. BBC One. 6 August 2011. Retrieved 23 March 2012. ^ "Bishop, Cole Sexiest Vegetarians," Belfast Telegraph, 30 December 2013. ^ Solutions, Powder Blue Internet Business. "John Bishop is UK's highest earning comic : News 2016 : Chortle : The UK Comedy Guide". ^ "Comedian John Bishop sells mansion to HS2 for £6.8m". BBC. ^ "John Bishop's Gorilla Adventure Episode 1". ^ "John Bishop joins The Nightly Show line-up for ITV". itv.com. ITV Press Centre. Retrieved 18 February 2017. 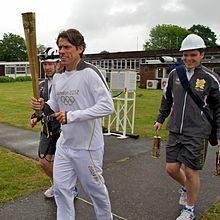 Wikimedia Commons has media related to John Bishop.